24th October 2013 Istanbul- Armona Denizcilik A/S was founded by Lorenz Weinstabl, 52, who holds a Master’s degree in Engineering and has been in the shipping business for more than 25 years. 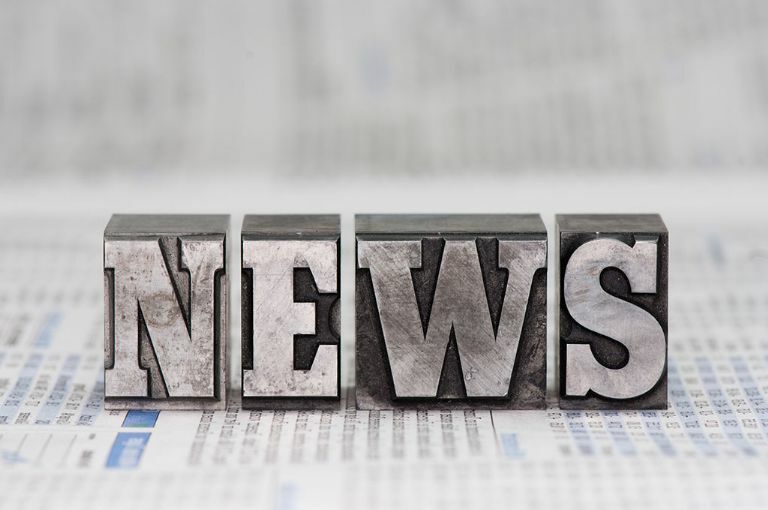 Lorenz Weinstabl is also the director of Atlantis Tankers, a group of companies, which is owned by German citizens, Marlon and Claudia Weinstabl. The company possesses a fleet of eight Chemical/Oil IMO2 tankers, categorized as “small tankers”, which operate in the short sea shipping trade. Four of these vessels are eight years old and are within the range of 3500 dwt. The remaining four were built in 2009/2010 and are within the 6400dwt range. All vessels are separately registered companies in Douglas-Isle of Man and sail a Maltese flag. Armona Denizcilik A/S was founded in 2002 and was engaged in the construction of vessels for Atlantis Tankers up until 2010. After undergoing a business expansion into technical and crewing management in 2009, Armona was able to take over the control of the Atlantis Tankers fleet, from its predecessor, V-Ship. Seeking further experience and increased business opportunities, Armona made an arrangement in 2012 with London-based Borealis Maritime. Armona’s technical management is now additionally in charge of a proportion of their fleet. IBEX Maritime, the first commercial managers of Atlantis Tankers, were taken over by Uni-Chartering in 2012. The agreement with Uni-Chartering has now been terminated by Atlantis Tankers. The board of directors of Atlantis Tankers has decided that the commercial management of their fleet will be lead by the Atlantis Tankers Group as of November 1st, 2013. Atlantis Tankers & Armona Denizcilik A/S would like to take this opportunity to thank both IBEX Maritime and Uni-Chartering for the many years of cooperation. 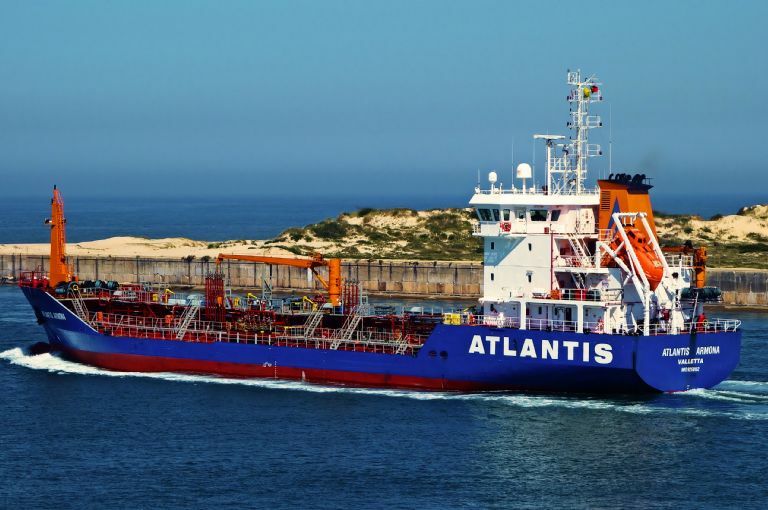 Atlantis Tankers gives commercial management to Armona Denizcilik A.S. Many pictures are taken from vessels, circulated around the globe, but not many come as a present like this one which was sent to us from Yardimci Shipping for Eastern as a gesture to soften the many years of tough cooperation the owners of the two organizations had. On her Voyage 063 Atlantis Armona was carrying 3.000 mts of Benzene from Terneuzen to Aveiro in April and the picture shows her leaving after discharge. 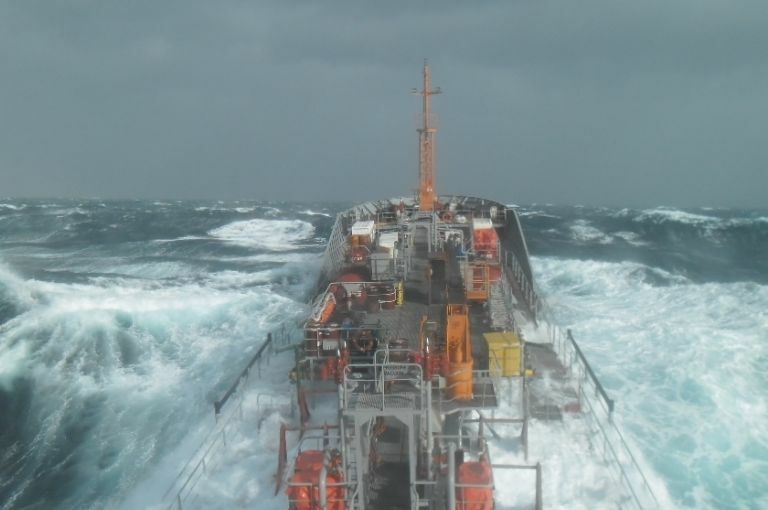 Far beyond this winter the weather has been very challenging on our vessels routes from Baltic down to the Western part of the Mediterranean. This has caused delays in our voyages and during extremities forced us to take shelter in a safe place. The picture shows our smallest vessel, Atlantis Antalya, on her way to proceed with a cargo of Styrene Monomer to her discharge port of Aliağa in Turkey. Shortly before Christmas and about 10000 kilometres from Istanbul away Mr Lorenz Weinstabl, the Director of the Atlantis Tankers Group was invited on board the Erria V by the Vessels Captain Marcelo Ledesma in Argentina’s Mar del Plata for an inspection followed by a delicious lunch. The “Erria V” ex “Atlantis Almeira” is in charter in America and Mr. Weinstabl found confirmed what his operator had been reporting, that the Charterers where very well maintaining the Vessel. Thank you for the hospitality! Our operator Armona Denizcilik was for the 2nd consecutive time invited by the Shipping Faculty of the September 9th University in Izmir to their 17th Winter career “open door” days in which ship-operaters where given the opportunity to present themselves and to answer upcoming junior officer and marine engineers questions in regard to their careers. The student conference took place on November 22nd and was led by our Crewing manager Özgür Çetinkaya and his assistant Emre Yalçın. Whilst repeatedly the question was raised by female students whether Armona’s policy would foresee employment of female graduates there has been an overwhelming request that Armona offers students a 10 week apprenticeship. In the past two years more than 60% of the apprentices had later started to work as officer on board of vessels operated by Armona which shows that benefit is provided to both sides and so Özgür offered to employ from the September 9 University in 2013 alltogether 7 students, four Deck and three Engine apprentices. 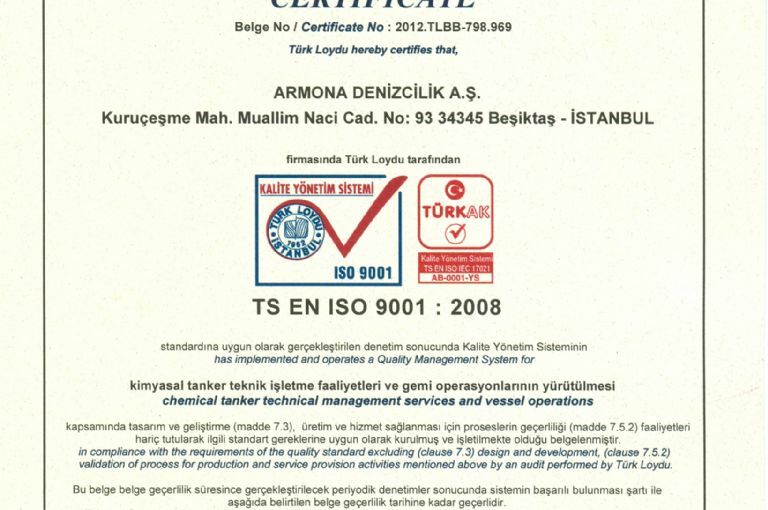 On July 13th 2012 our Technical Manager organization Armona Denizcilik AS was awarded certificates in compliance to the Standards ISO 9001:2008 (Quality Management System), OHSAS 18001:2007 (Occupational Health and Safety Management System) and ISO 14001:2004 (Environmental Management System) by the SWEDAC member Turkish Loyd. These documents are a recognition for the nearly 8 months of hard work led by our DPA Capt. Gökhan Özgal as Management Representative and his ISO team members which we would like to commemorate for their success. The application of this Management System is not limited to the Main Office but also includes each of the vessels managed by Armona Denizcilik. Training sessions in integrating Quality, Environment and Health Management Systems for all our staff was held in the office and on board the ships and tested finally by a vetting. With the achievement of implementing these high standards, and by accomplishing the TMSA Element 10 in Environmental Management we climbed another notch in our TMSA level. On the occasion of her concert in the Kurucesme Arena located on the side of the Bosphorus and infront of our office we hosted our clients, suppliers, business partners and friends at the annual Armona Summer Party. Ajda Pekkan is a Turkish pop singer and actress. Through a career spanning five decades thus far, Pekkan has released more than 20 albums and, with Sezen Aksu, is the most commercially successful female Turkish music artist with the sales of over 42 million copies worldwide. She is nicknamed the "Superstar" of Turkish pop music. With around 100 guests and Döner Kebap we celebrated over midnight and would like to thank all participants for the cheerful evening.